Discussion in 'Research News' started by rogi, Feb 5, 2013. As of today an article about implants, to make an end of tinnitus, appeared in a dutch newspaper. I'll do my best to make it readable to you. "Patients consider suicide because of tinnitus"
Researchers from the Academic Hospital Maastricht (The Netherlands) are close to a unique discovery: A device that relieves people from tinnitus. It will cure hundred thousands of Dutch people tormented by ringing in ears. "You can literally get crazy from this noises in the ears." Maastricht - There are almost two million people in The Netherlands that suffer from tinnitus. Ten thousand of them experience it so bad that they are literally getting crazy from it. "You have patients that consider suicide because they can't handle it anymore," says Margriet van Loon. "I understand why those people consider it. You can't explain other people how much of a torment this ear noises can be." Margriet van Loon(56) has got tinnitus for almost 30 years. She hears sissing, but also high noises that vary in pitch. It is a torment. But there is hope. The Academic Hospital Maastricht is working on an implant that is making an end to this trouble. The researchers are placing implants in 10 patients ears very soon, says researchleader Robert Stokroos. "This 10 patients have tinnitus in one ear. So that you can clearly measure the difference between what they can or cannot hear." The implant is placed inside the cochlear. In the cochlear air vibrations are translated into electric signals which will be converted by the brain into sound. Stokroos explains that people with tinnitus suffer from an disordered "pre-amplifier" inside the brain stem. Instead of normally translating electronic signals into sound it makes random sounds itself. With the result that people hear sissing, beeps, low noises etc. Some of the tinnitus sufferers, like Margriet, experience tinnitus 24/7. "At daytime i try to ignore it by listening to music. But at night i have a hard time to sleep because the sound keeps me awake." Doctor Stokroos and colleague researchers hope that the implants will make an end to all of this. He says that the implant is sending electric pulses to the brain of the patient. "At all kinds of pitches and levels as long as we will find the 'silence code': a signal which will stop the tinnitus." At the same time researches from Maastricht are also busy with trying to stop tinnitus by Deep Brain Stimulation. With this technique, a pacemaker is put into the brain. Just like a pacemaker for the heart it also sends electronic signals. The signals should interrupt tinnitus. "At the moment this treatment is tested on animals. With the implant we are now starting to test it with people and hope they will have good results within 2 years." says Stokroos. At the moment Margriet tries to stay positive in life. "I'm always thinking of that it could be much worse than how i'm experiencing it and i'm trying to avoid crowded places. Every year i'm going to North Sea Jazz with knowing that the tinnitus will be three times worse the next few days. The noises are so loud the next days that i'm unable to think. But i'll just take that for granted." Margriet hopes for the moment when she can experience silence again. "Let's see if this implant really works. I like the fact that there is a lot of research at the moment to find solutions to cure tinnitus. There is a lot of research done in cities like Maastricht, Groningen and Antwerpen. I hope this research will lead to the finding of a cure. And when it will not cure me, i hope it will cure patients." Review: cochlear implants as a treatment of tinnitus in single-sided deafness. Arts RA, George EL, Stokroos RJ, Vermeire K.
Tinnitus is a symptom that is highly associated with hearing loss. Its incidence is expected to increase due to the detrimental effects of occupational and leisure noise. Even though no standard treatment is currently available, the effect of cochlear implants on tinnitus in single-sided deafness (SSD) is under scientific attention. This review reveals an overview of all publicly available reports about cochlear implant as a treatment for tinnitus in SSD. Cochlear implantation in SSD suppresses tinnitus in most of the cases. Some studies even demonstrate complete tinnitus suppression after implantation. No tinnitus worsening is reported in any of the cases. Furthermore, tinnitus does not restore during the electrical stimulation presented by the cochlear implant. The tinnitus level seems to stabilize after 3-6 months after the first fitting. Although the underlying mechanism responsible for the observed tinnitus suppression is not yet clear, cochlear implantation should be considered as a treatment option for tinnitus arising from SSD. However, appropriate patient selection is essential as it is expected that it is a requirement that tinnitus arises from cochlear deafferentation. This is news! While deep brain stimulation is being tried in the US and Europe, implants inside the cochlear is new and noteworthy! Please rogi keep us posted on further news! Bring it on! Would be so awesome if it worked. Wait, is this method only for people who are deaf in one ear? The topic title says "Single-Sided Deafness"
But its not mentioned again in the article, so I am a bit confused. great news, so far this year there has been a lot of good news like this one, hearing restoration and the MRI guided ultrasound! a good start to the year. In the original article rogi translated a researcher by the name of Robert Stokroos is mentioned, also the location Maastricht. In the PubMed article I pasted below the first message of this thread, one of the authors is Robert Stokroos (and the PubMed one is dated Oct 2012). Also the subject matter (cochlear implants) matches, which makes me think the thread's title might be correct. It's possible the newspaper article omitted the fact that the 10 people have single-sided deafness, but I'm not sure. "Although the underlying mechanism responsible for the observed tinnitus suppression is not yet clear, cochlear implantation should be considered as a treatment option for tinnitus arising from SSD. However, appropriate patient selection is essential as it is expected that it is a requirement that tinnitus arises from cochlear deafferentation." So I guess currently it's expected to help only in these cases, but I don't have any knowledge whether it's been tested for bilateral tinnitus or if/when it will be tested.. I removed the mention about the SSD from the title now. Even though I still think it's a bit too much of a coincidence for these two (the PubMed article I pasted & the newspaper article) not to be linked, as per my previous post in this thread. We'll see. Whatever the case, hopefully the results will be promising. And, rogi, it's much appreciated you took the time to translate. Hopefully you keep us posted if something new about this is published on the Dutch media. Even though I have good hearing in my ears so this treatment will be unlikely to benefit me, I genuinely wish those people success. I will be truly happy if ANYONE out there manages to cure ANY kind of constant tinnitus. I think all we need is that one real success which will push the whole field of ENT medicine to find similar treatments for others. I wonder how they select candidates for cochlear implant for T? I wonder if they check for hearing loss only up to 8khz?! I would assume the implant would be capable of receiving the full spectrum of frequencies right up to 20khz? Apparently these implants sound tinny (I asked the first audiologist I ever saw about them). I'd trade tinny sounding hearing for removal of T any day and I know most of us would. After re-reading the first post I think what I'm talking about above and the thing they are doing in the Netherlands is different because the cochlear implants I asked my audio about are already being done on people. Imagine suddenly being able to hear the words and tone of the person across the table from you in a crowded restaurant when once you only heard overwhelming noise. Or speaking on the telephone with confidence because what you hear is now crisp and clear. Longtime cochlear implant users are reporting such dramatic improvements in their hearing, thanks to new image-guided programming methods developed by Vanderbilt University researchers. That's great. How about imagining suddenly being able to hear conversations and ambient sounds without a constant noise in your head? I would go for a non-surgical process that would do that for me. CI [cochlear implants] can successfully be used as treatment of severe tinnitus in patients with single-sided deafness and is equally effective for pure tone, narrow band noise, and polyphonic tinnitus. Long-term results show that implantation provides durable tinnitus relief in these patients. These results support the hypothesis that physiopathological mechanisms after peripheral deafferentation are reversible when hearing is restored. Single-sided deafness accompanied by severe tinnitus is a new indication for CI. Good find, and is related to a recent, previous thread about SSD and tinnitus, so I merge these two. What would this mean for those of us with little or no noise induced hearing loss? I am right above what they consider "normal" hearing. I don't know if I would want to destroy my cochlea for have a CI when I have normal hearing. The tinnitus is annoying, but I suppose this represents a furthering of the understanding of the condition. The original article also mentioned a sort of "pace maker" for the brain to suppress tinnitus, which might be pretty cool too. It says they've got some clinical trials including people going for this deep brain stimulation. It would be pretty cool to see some sort of success treating tinnitus, as I think it would open the flood gates of research. Music would be better than the alien noise most of us hear. This highlights a possible causal relationship between anxiety, high blood pressure, and tinnitus. Anxiety causes high blood pressure. High blood pressure causes tinnitus. There Is a guy on RNID tinnitus forum,my heart allways went out to him. He has T and is totally deaf.How must that be? Never ever being able to get away from It.He had 2 implants and sadly got no changes In hearing or T.
i have "centralized" tinnitus for over 30 years and have had a CI since 1989. not much change in T for all these years. In your 30 years of T, do u follow other treatment sciences and/or have u noticed a progress in context of finding a cure for T? I guess after 30 years you could get very settled with the eternity aspect of it all? I've just got T and I'm finding out what type of "T time" we're at in the moment, seems to me that the science of this is doing progress and that there's quote a lot of activity out there in the medical industry. I don't know how it was in -86 but I guess they didn't even treat T as a neurology symptom, as in brain issue. So I can assume this treatment wouldn't work with someone with an actual hearing impairment from damage to the cochlear. If the hair-cells aren't there, then they won't pickup on any of the signals emitting from the implant. I don't know how it was in -86 but I guess they didn't even treat T as a neurology symptom, as in brain issue. This is/was the main issue. Now that they finally identified T as a neurological disorder, they can focus on treating it as such. It's a shame it took this long for the community to finally come to a consensus. And sadly, some of the community are still stuck on past theories. Our main hurdle today is that a good chunk of research and development is relying totally on the private sector, and big business is just starting to take an interest. Electrical stimulation? Maybe I should just try to stick my fingers inside an outlet? 240 volt right there! If I'm not mistaken, doesn't cochlea implants require the use of hair cells? It would be completely useless to those with damaged ones. google translated another Belgian article. Antwerp University Hospital has a major hurdle in the fight against tinnitus , better known as tinnitus . For eight years, scientists sought a method to treat tinnitus who received , after they were nearly or completely deaf in one ear rather people. Per million people will be affected . 7,000 people Who would benefit from the new treatment all while could be . Until recently done nothing for them theoretically It was the team of Prof . Dr. . The Heyning that the new treatment developed and saw recently adopted internationally . Specifically, they consist in patients receive an implant implanted during a two-hour operation , which is activated by a device that is worn behind the ear or directly to the scalp . It is the same type of implant , which until recently was only implanted in people who completely (or almost completely ) were deaf . But it also takes away tinnitus in cases of deafness in one ear , is completely new . " People who for some reason , for example due to a virus , be deaf in one ear tinnitus often get there on top ," says Prof . Dr. . The Heyning . "One million people there are just about 7,000 . Basically could hitherto not be helped. By giving them a cochlear implant we give them not only their speech perception back , we can strongly reduce also the tinnitus . Completely remove it we can not. But we can make it much more bearable . 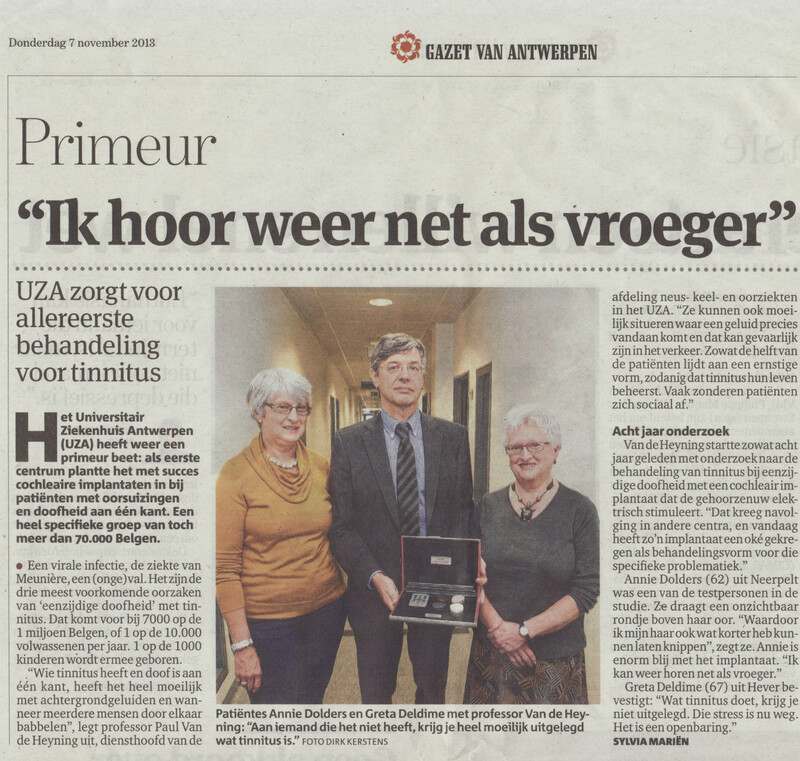 "38 patients The scientists of the UZA worked eight years to get the treatment method and point in that period gave 38 people a cochlear implant . Were all found to benefit from the new method . Similarly Greta Deldime ( 67 ) from the Flemish- Brabant Hever and Annie Dolders (62 ) from Neerpelt . Both women saw their lives take a drastic turn after they came in contact with Prof. Dr . The Heyning . "I went from doctor to doctor for years ," says Greta . " It was maddening . I was constantly suffering from tinnitus, but nobody could help me . Nobody found a solution . The shackled me almost to my house . I avoided company. I could not listen to music. And even the was worst : no one saw anything to me you get the people to not explain what's wrong with you " . . The implant gave the women a life again . " Suddenly I got back life before ," says Annie . "I can not miss a day . " After eight years, the treatment now internationally recognized . That means she might be . Repayable at a later stage An implant now costs in the region of 20,000 euros . But if we did this we would get like youtube-240p sound in our ears? Anybody Here with Cochlear Implants? Friend of Mine; Sudden Complete Hearing Loss, Will Cochlear Implants Help?